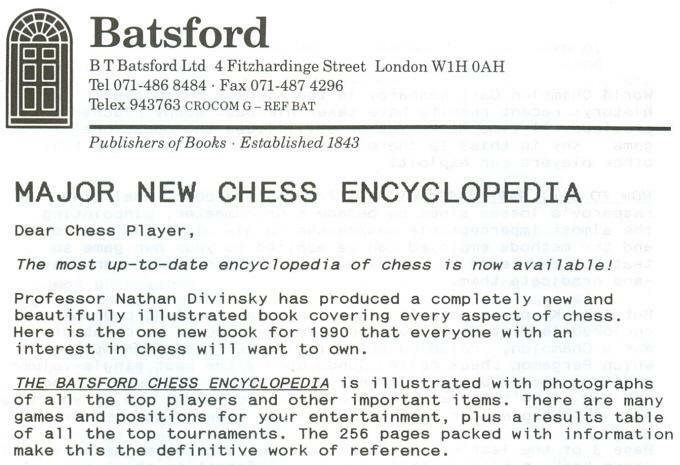 The dust-jacket of The Batsford Chess Encyclopedia by Nathan Divinsky trumpets ‘the game’s most complete and up-to-date work of reference’. What is provided is a shambles full of mistakes, misjudgements and misprints from cover to cover. The present review merely aims to point out a warning sample. Despite a further dust-jacket pledge of ‘explanations of all technical terms’, there are many omissions, such as ‘bind’, ‘excelsior’, ‘skewer’ and ‘transposition’. What definitions we are offered are frequently casual and imprecise. On page 86 a hole is described as ‘the square in front of a backward pawn’, which is contradicted by the editor’s own use of the word on page 154. On page 146 the description of the Forsyth (misspelt as Forsythe) Notation as ‘a simple and effective method of describing a chess position’ is belied by a mix-up over white and black bishops in the illustrative diagram and caption. Page 157: the units in a pawn chain do not have to be ‘opposed by an enemy pawn chain’. Page 211: Divinsky fails to record that there are two separate versions of the Tarrasch trap. Page 232: a waiting move does not necessarily occur in the ending. Even the definition of resign on page 174 (‘to give up the game before being checkmated’) is inadequate because a player may resign by mistake (as in the second diagram on page 54) and even, in theory, when his opponent has insufficient mating material. Definitions need proper thought to cover all eventualities, however rare. There is also little rhyme or reason to the selection and balance of biographical entries. Figures such as Albin and Przepiórka have no entry at all, although room is found for a five-word one on José Ferrer (‘Movie actor who enjoys chess’). Denker, a US champion, gets two lines, but, just overleaf, Divinsky awards himself five times as much space, taking the opportunity to record for posterity that he was ‘on the BBC chess TV show during the London half of the Kasparov v Karpov match of 1986’. (Divinsky scatters numerous self-mentions throughout the encyclopedia, notably for Warriors of the Mind, a book widely derided by critics.) Page 87 of the encyclopedia calls Nimzowitsch and Réti the leaders of the Hypermodern school, but whereas the former has a four-column entry with an illustrative game, the latter gets only one column and no game (just an over-familiar endgame study). A composer of the stature of Rinck receives, apart from an illustrative composition, a grand total of four words. Problemists, and especially problem terminology, are treated with even greater disregard. Hübner’s name is spelt three different ways in the book’s first 31 pages. Page 2 refers to the ‘Suisse’ (instead of Sousse) Interzonal of 1967. Other assorted misspellings include ‘Teichman’, ‘Le Lionnaires’ (instead of Le Lionnais), ‘Kerchnoi’, ‘Nimjowitsch’, ‘English’ (for Englisch), ‘Boundarevsky’, ‘Duz Khotmirsky’, ‘Du-Duz-Khotimirsky’, ‘Blackburn’, ‘Card’ (Caro), ‘zugswang’, ‘Anderseen’, ‘The Philodorian’, ‘Philador’s Legacy’ and many more. Some foreign accents are put on once in a while, but most never at all. Page 5: Alekhine was initially buried in a cemetery (‘cemetary’ in Divinsky’s spelling) in Portugal, not France. Page 9: the move 1 a3 was not ‘first played by Anderssen in his 1858 match with Morphy’. Page 36: Corzo should be described as Cuban Champion. Page 91: Jaffe did not win ‘two tournament games from Capablanca’. Pages 115-117: the three-page entry on London makes no mention at all of the 1922 tournament, which featured three world champions. Page 131: the entry on Modern Chess Openings (21 lines) does not even name Walter Korn, the person responsible for the book for the past 50 years. Page 194: Capablanca’s simultaneous score should read 102 wins and not 120. The encyclopedia also contains many self-contradictions. For example, page 40 says that variations in castling continued until the seventeenth century and, in Italy, until the twentieth century. But page 178 asserts that ‘there was ambiguity about castling until about 1474’. Page 62 announces that Morphy won the world championship, but elsewhere (page 240, for instance) it is stated that the world championship did not exist until two years after Morphy’s death. Page 81 reports that Steinitz used the term hanging pawns, but page 144 states that Nimzowitsch introduced it. The entry on Kostich (or Kostic – Divinsky varies the spelling elsewhere) claims (page 104) that in 1916 he set a simultaneous record of 30 blindfold games, yet page 175 says that Réti achieved a blindfold simultaneous record in 1925 by playing 29 games. Book references are full of mistakes. For further reading on Charousek (page 42), two books are recommended, but both authors’ names are misspelt. Page 68 asserts that Fischer’s Chess Games was written by two people whose names, in fact, appear nowhere in that book. The titles of two of Purdy’s world championship match books (page 167) are an invention. A minor book on Smyslov is mentioned, but not his important autobiography (page 196). English-language titles and publication dates are often given in contradictory forms in different entries; for example, Fine’s psychology work on page 67 and page 167, and many other masters’ books, even the best known ones in chess literature. Page 110 and page 204: Lasker’s Manual is given contradictory titles and contradictory publication dates. Foreign words/titles are massacred. The entry for Kahn on page 93 lists four titles, with several errors. Breaking with literary convention and common sense, Divinsky has translated into English many (but not all – there is never any consistency) foreign book titles, a procedure which gives the false impression that English-language editions have been published (e.g. ‘Ragozin’s Best Games’ on page 172). On the other hand, when such an edition does exist, fresh misunderstandings arise. For example, page 30: David Bronstein – Chess Improviser appeared in Russian in 1976, but not in English until 1983. Confusing misprints abound. On page 165 a title is not italicized when it needs to be, but a couple of pages later two authors’ names are italicized when they shouldn’t be. Chess periodicals are treated with similar negligence. The American Chess Bulletin cannot be described (page 7) as ‘bi-monthly’. Purdy’s famous Australasian magazine is repeatedly given as ‘Australian’. Page 93: the information about Kagan’s magazine is wrong. 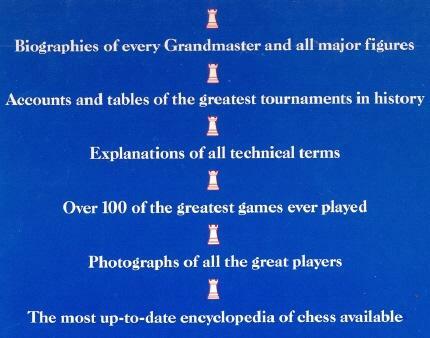 Page 142: New in Chess (which appears only in English nowadays) is not a ‘monthly magazine’. Divinsky writes both ‘La Strategy’ and ‘La Strategie’ (without the required accent on the e, of course). Page 242: ‘Belinger Schachzeitung’. Berliner is meant. The book purports to give exact birth and death dates of personalities whenever possible, yet despite writing on page 73 that Gaige’s books are ‘indispensable for chess authors’, Divinsky is clearly unfamiliar with Gaige’s indispensable 1987 work Chess Personalia. The result is disaster. Dozens – yes, literally dozens – of dates are unnecessarily wrong, incomplete or missing. If people like Gaige put nearly 25 years’ research into a book, why can’t people like Divinsky be bothered to take notice? An exposé of the encyclopedia’s treatment of dates could be the subject of a lengthy separate review, but two brief points will suffice for now: Sergey Smagin (page 195) mysteriously has no birth reference at all, and Udovčić, Yudovich and Lundin are believed by Divinsky still to be alive. Unbeknown to the ‘most complete and up-to-date encyclopedia’, they died in 1984, 1987 and 1988 respectively. Although Divinsky is so manifestly out of his depth on even elementary factual matters, he is seldom shy about dispensing his opinions and prejudices. Page 239 pontificates that the books of Znosko-Borovsky ‘have not stood the test of time’, ignoring the fact that several of them were/are still in print decades after Znosko-Borovsky’s death. (The test of time? There are few pages in Divinsky’s encyclopedia that have stood the test of two minutes’ scrutiny.) Passing over Ernst Grünfeld’s monumental theoretical activity, Divinsky attacks the man: Grünfeld was ‘uneducated, unsophisticated, superstitious and almost primitive’ (page 78). On page 174 we are informed that ‘Reshevsky is a short, grim and determined man with little charm or graciousness’. The entry on the ‘controversial’ Campomanes is predictably hostile. True to Batsford’s style of sledgehammer propaganda, the criticism is repeated in the entries on Karpov and Kasparov, in identical words both times. Equally predictably, the entry for Batsford’s controversial chess adviser (page 97) is abject flattery. It takes up more space than the article on Gunsberg, who was a world title match contender. When Divinsky likes someone, the honey flows. Averbakh is ‘charming’. Dlugy is ‘charming’. Larsen is ‘charming’. Seirawan is ‘charming’. Short is ‘charming’. Ståhlberg is ‘charming’. Timman is ‘charming’. Spassky’s third wife is ‘charming’. Marco’s annotations are ‘charming’. Baden Baden is ‘charming’. Montpellier is ‘charming’. And so, of course, is Lodewijk Prins. Prins charming. Divinsky thrives on rumours, and much of what he tells us is like gossip over backyard clothes-lines. Sentences begin with ‘Some say that ...’, ‘It is said that ...’, ‘He is said to have lost ...’, ‘Janowski is reputed to have said that ...’, etc. Numerous articles are childish (e.g. the patzer entry on page 156 and the Carlsbad material on page 199). The entries on both Korchnoi and Maróczy make a fuss over that occultist yarn about a game between the two players. Perhaps the paranormal can also explain why Divinsky unwittingly claims on page 110 that James Gilchrist co-authored a book which was not published until 13 years after his death. Many sentences are impenetrable. Page 66 says that Filip ‘is a lawyer and can be called Dr Filip’. Page 76 proclaims that Gligorić ‘evolved to a curious cross between Rubinstein and Capablanca’. Page101 tells us that the knight is ‘one of the most interesting pieces on the chessboard’ (which ones are more interesting and which less?) and that ‘knights can be quite effective’ (which pieces can’t be?). Page 198 speculates implausibly that after the 1972 match ‘Fischer was completely wiped out of chess by Spassky’. Worst of all, Divinsky presents other people’s writings as his own. For example, on page 37 he says of Capablanca: ‘What others could not discover in a month’s study, he saw at a glance’. Word for word, that is what Reuben Fine wrote about the Cuban on page 111 of his 1951 book The World’s Great Chess Games. Without a murmur of acknowledgment, Divinsky’s book lifts countless chunks from The Encyclopedia of Chess edited by Harry Golombek (Batsford, 1977). The fact that Divinsky was part of the 13-member team of contributors to that earlier volume hardly entitles him to present under his own name the work (even entire entries or paragraphs) of the other contributors, notably the late Wolfgang Heidenfeld’s technical and illustrative material. The déjà vu starts on the very first page (see the article on adjournment) and endures until the very last entry in the book (Zwischenzug). But Divinsky not only copies, he copies undiscerningly. For instance, he fails to correct Pachman’s Czechmate in Prague to Checkmate in Prague (page 155) or Young’s Chess Strategies to Chess Strategetics (page 237). The appalling truth is that he has repeated dozens – yes again, literally dozens – of factual mistakes in the Golombek book, including many that were pointed out by reviewers at the time. None of this inhibits the latest Batsford handout from informing the public that Divinsky’s encyclopedia is ‘completely new’ and ‘the definitive work of reference’. In reality, of course, The Oxford Companion to Chess is so overwhelmingly superior in all respects that direct comparisons with The Batsford Chess Encyclopedia would be piteous. It would be like comparing a Rolls-Royce and a rattle-trap. See also pages 41-42 of John Nunn’s Chess Puzzle Book by J. Nunn (London, 1999 and London, 2009). Note: In a gross violation of our copyright, Kevin Spraggett has reproduced the entire text of our article (2,000 words) on his website. Latest update: 6 November 2018.